In the early 1980's the maze games were all the rage. 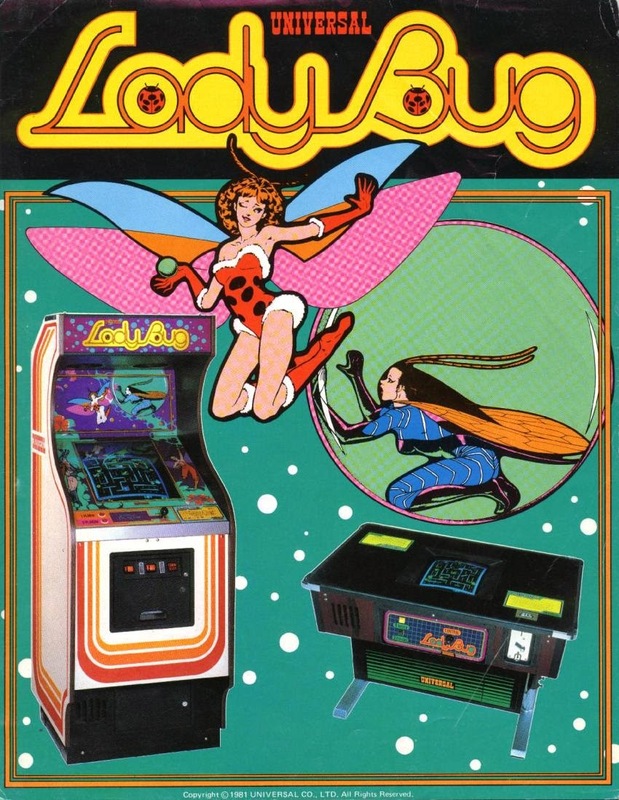 Universal Lady Bug was a great contender which although wasn't as popular as Pac-Man or Ms. Pac-Man, it certainly had it's own unique features which added just enough to separate the game from the competition. The game play is similar to the Pac series instead of collecting dots, your collecting what looks like asterisks or tiny flowers. You have other insects chasing you not ghosts. The cool part about Lady Bug is that you can manipulate the maze you have these levers which can alter the maze and temporarily keep the enemies away from killing you. Prior to the enemies coming out of it's area the outside of the maze has a count down timer indicating when they will start to be released. Skulls are helpful so long as you don't touch them, however it will kill the enemies if they touch them. Once all of the enemies are released on the level the inside area will have a bonus vegetable which will temporarily freeze the enemies once it's touched, and award you with bonus points. As you continue to move through the levels the point value of the vegetable / item will increase by 500 points, however once you hit level 18 it will max out at 9500 points. You also have letters in the game which if you collect the red letters it will spell out SPECIAL, collecting the yellow letters spells out EXTRA. If your playing the game on location and you want to try and earn an extra credit collecting special will do just that, if your looking to prolong your current game keep spelling EXTRA with the yellow letters and you will be awarded an extra lady bug. In addition to that if your really looking to maximize your score collect the blue circles with the pink hearts, this will advance the multiplier up to 5x. When you do this if you collect a red letter they will be worth 800pts x 5x which will equal 4000 points. 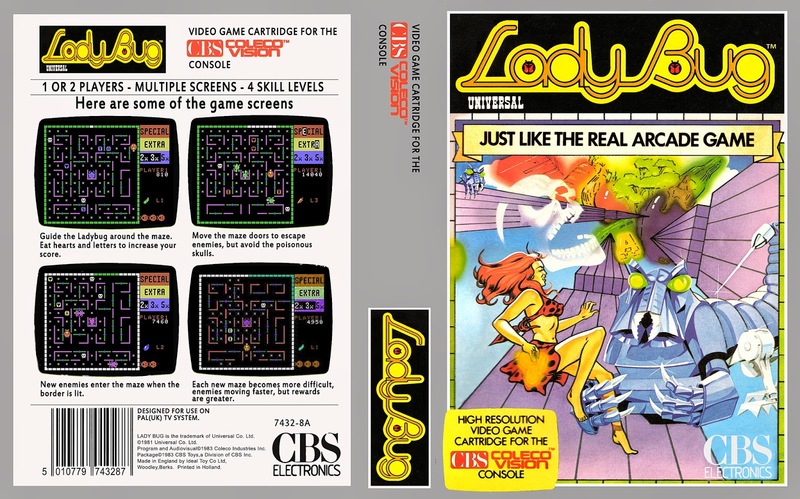 Lady Bug actually got more exposure from the Colecovision. However the Arcade version had superior graphics. When I first got the game it was in fair original condition considering the games age. However someone at some point drilled the original plastic control panel and used an adapter plate to use a wico joystick. 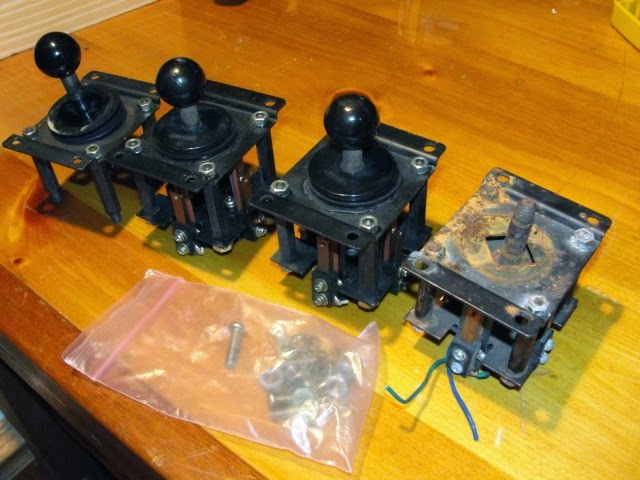 For nearly almost a year I looked for a replacement control panel and proper joystick for the Universal cabinet. Although the wico joystick is in my opinion a better functioning joystick I wanted to track down the original one that the game utilized. At first I got cocktail joysticks which were slightly shorter. I finally found a replacement control panel without it being molested but the ball top was missing from the original joystick. After continuing to search and search finally I was able to find the direct ball top replacement which according to the manual is a 32 mm ball top. 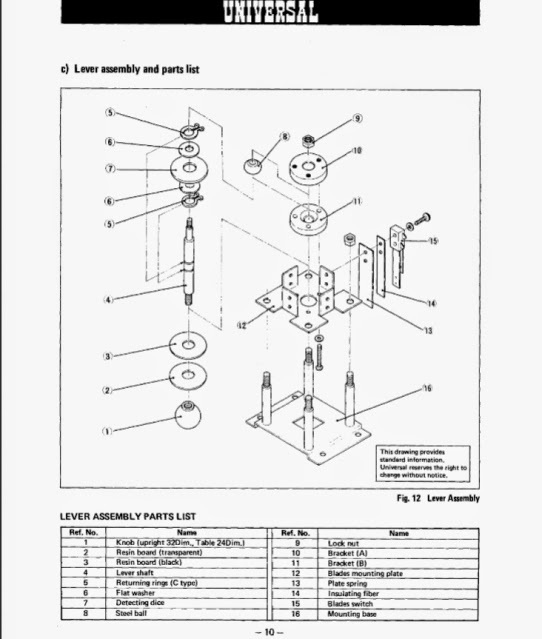 This Universal cabinet was originally built in Taiwan. I would go as far to say that not many things were universal about them. Some had slight variances from game to game. Another popular Universal title which shared the same generic cabinet was Mr. Do. And over the past roughly year you can see some of the bits and pieces of other Universal Joysticks I've come across. The first three are cocktail joysticks and the one on the right with the missing ball top is for the upright. I had another member sand blast the rust off of it, and ended up actually selling majority of these as I don't really need that many back-ups. Another member had a Space Panic control panel with the upright joystick and I ended up using that and selling the remainder of the Space Panic control panel populated. Another thing the universal control panel had was these cross haired translucent player one and player two start buttons. These are actually more commonly found as Gottlieb pinball flipper buttons. The artwork on Lady Bug is nicely done which I think it was originally done by the artist Kohtani. I pulled the original marquee off since it had some tape / residue and minor scratching. Using goo gone, as well as novus it started to clean up nicely. Below you can see a picture of the marquee of what it looked like to prior to cleaning it up. I have seen a few variations of the Lady Bug marquee the one I have which is more of a magenta or pink type background as well as a green one. One of the coolest features of the Universal cabinets below the marquee is the back piece of plexi gets lit. It creates a really nice look and certainly stands out from other games. It's really one of the few games I can think of that this is featured on. 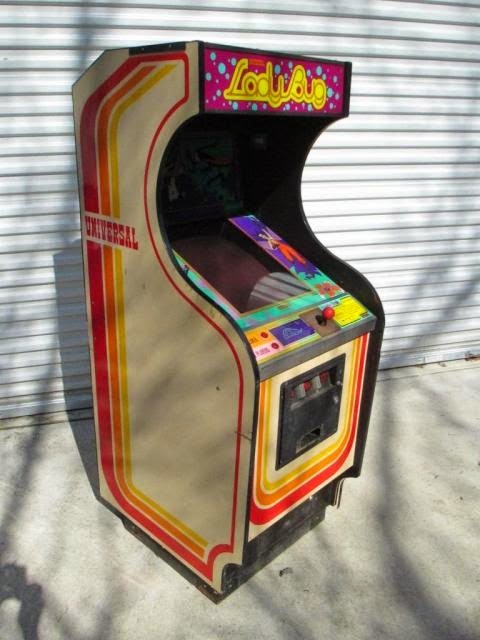 One of the games biggest eye sores was the original coin door needed to be cleaned up. I stripped all of the parts off the coin door and sanded / painted accordingly. In addition to that the bottom area was also painted black as well. Another thing that the Universal cabinets have is flat 3/4'' T-Molding. Although mines not perfect and could use a replacement It's still mostly intact so I left it because I wasn't able to find a suitable replacement. After working on the game with my magnetic tools the monitor colors were off & needed to be degaussed. If you have one side of your monitor with good colors and the other side is faded or looks odd try using a degausser, most likely it will fix your issues. I once again used my GC Throsen 9317 High Power Degaussing Coil, which can be purchased here. As of right now currently my high score on Lady Bug is 123,600.